Happy Food Blogger Cookie Swap Day! 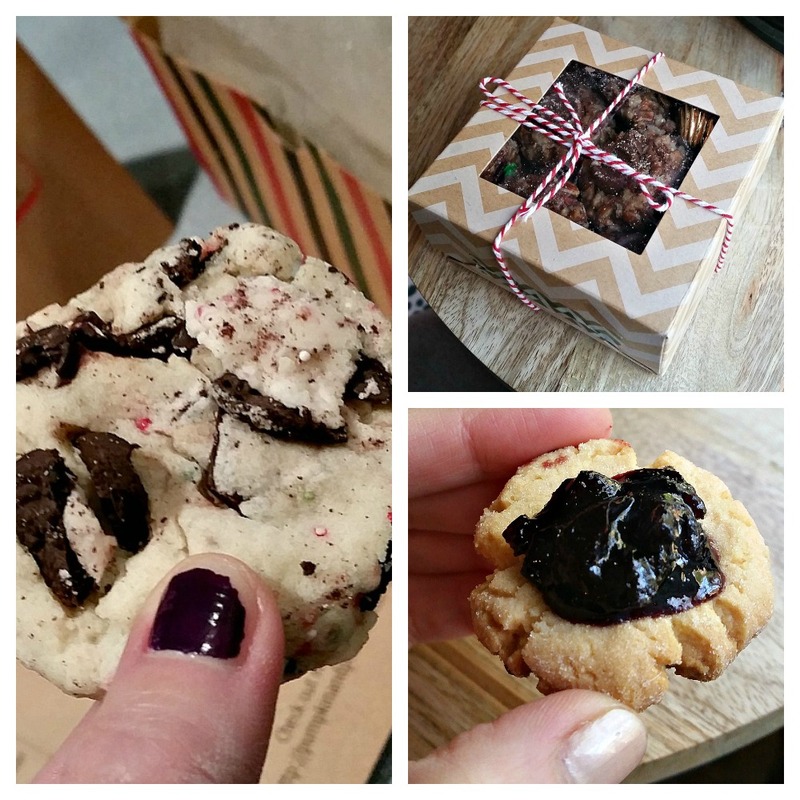 This year, I am fortunate enough to participate in the Great Food Blogger Cookie Swap 2015. What does this mean? Participants make a small donation to this year's charity, COOKIES FOR KIDS’ CANCER, a national non-profit organization committed to funding new therapies used in the fight against pediatric cancer, which claims the lives of more children in the US than any other disease. We each receive three names of other food bloggers and mail them a dozen cookies! You get a delicious surprise from a stranger -- how fun! What did I receive in the mail? 1. Trashed Up Peppermint Chocolate Chunk Cookies from Liz at Pumpkin & Peanut Butter. I got these before Thanksgiving and I was so pumped! Liz and I have been blogger friends for over a year, so I was sooooo excited to get cookies from her! They were delicious and devoured quickly. 2. Roasted Almond Thumbprints from Devangi at Pistachio Doughnut. I received my last two sets of cookies right around December 2nd, so there were a lot of cookies in the house! These cookies had a rich almond cookie with a jam filling. They were truly yummy. If you live near a specialty spice store, you should be able to find both black and green cardamom, sometimes only in pod form. Black cardamom has a smoky and spicy flavor, while the green has no smoke and the same kind of spice. If you are unfamiliar with cardamom, I've heard it referred to as the cinnamon of India. In my recipe, I had black cardamom pods and cardamom powder -- at the very least, you should be able to find (green) cardamom powder at your grocery store, in the spice aisle. For this recipe, you can place the black cardamom pods (or green) into the rolling sugar two or three days ahead of time. You want to infuse that sugar with the smoky scent. You can also use a spice grinder to grind the black cardamom seeds and sprinkle that in as well. If neither of those options sound good, simply take some cardamom powder and sprinkle it in with the rolling sugar. 1/8 tsp. black pepper -- good, I promise! Preheat the oven to 375°. Line two baking sheets with parchment paper. In a small cup, combine the flax and water. Stir and allow it to sit for 5-10 minutes, until thickened. In the mean time, combine your dry ingredients in a medium-sized bowl: flour, baking soda, salt, cinnamon, ginger, nutmeg, cloves, cardamom, and pepper. Set aside. Using a cookie scoop, scoop out even-sized dollops of dough and roll them into balls using your hands. Roll the ball in the sugar/cardamom mixture and place it on the cookie sheet. Repeat this with all of the dough. Using your fingers, smush the cookies down slightly; they will spread a little, so space them out accordingly. Bake the cookies for 8-10 minutes, depending on how large they are. Mine took closer to 10 minutes. Allow them to cool on the tray for at least 5 minutes before transferring them to a cooling rack.